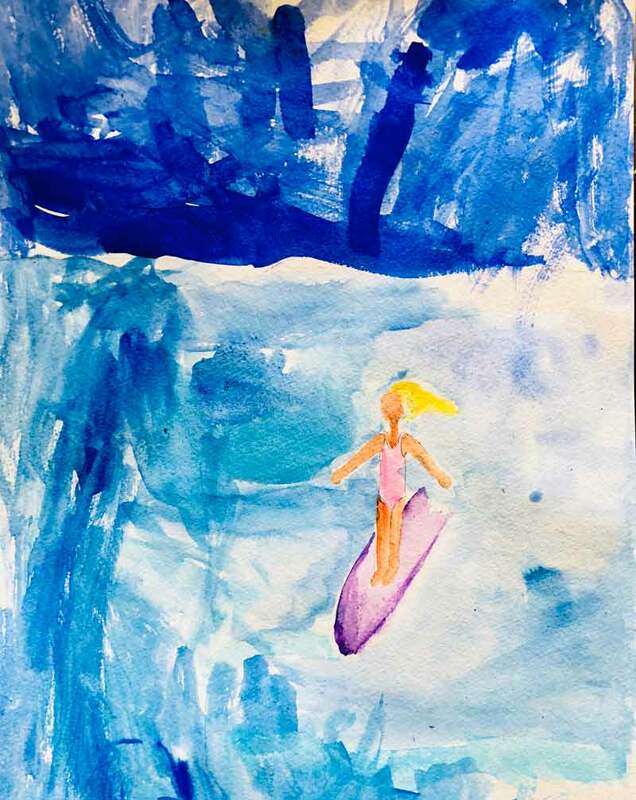 A heart-warming painting by creative mother-daughter duo of a young girl surfing. A dynamic, moody, playful expression of a young girl’s daydreams. Young Girl Surfing is a joint work by mother-daughter team, Heidi and Caris. They painted it while visiting Heidi’s mother’s Maui studio. Caris was sure in her choice of painting herself as a surfer although she had yet to attempt to surf. She also chose to make her surfboard purple because there really is no better color in the rainbow. Heidi created Caris’s figure and painted the waters around her flat and calm. Caris made the water more dynamic and challenging which is symbolic of her starting kindergarten in the near future. I haven't slept for more then 4 hours straight in over 5 years and I selfishly write in the nooks and crannies of my days, between preschool runs and diaper changes, to remind myself of the independent and adventurous woman I was before the birth of my now 5 year old daughter and 2 year old boy/girl twins. I backpacked through Australia–surprising a few snakes and crocodiles, attended an all woman's college in Southern California and managed to graduate without ever having shaved my head, studied English literature and the art of afternoon tea at Oxford University, and wrote for a year in Edinburgh Scotland. I fell in love with the mountains, snowboarding, and with an Australian man while living in Jackson Hole, Wyoming, and we moved to Boulder, Colorado, where we have started and grown our family. Today, our adventures may not involve traveling thousands of miles, but they are no less momentous and life-altering.